This is an old story now being presented in the New York Times. But still very much relevant. I described it in some detail in November on this blog. 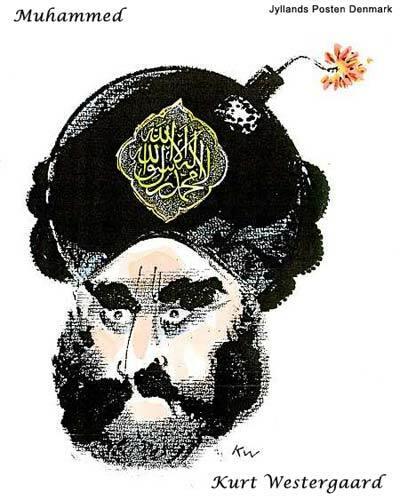 But briefly it concerns the largest Danish Newspaper publishing 12 drawings of Mohammed as a test of press freedom. As you can see in the one above - not flattering at all. You can see all the drawings here. The reaction was extreme. Death threats, a Pakinstan award for killing the artists, Arabic outrage - 11 Arabic ambassadors sending a protest to the Danish government, outrage in the Arabic League and so forth. All because you are not allowed to draw Mohammed. Fortunately the Danish PM answered back to the ambassadors, that Denmark has press freedom and his government no power to control content. But of course they would be welcome to try the Danish juridical system. Of course, later on, the United Nations through a French (!) spokeswoman has condemned the drawings. This followed by an Italian (!) EU commissioner. What can you expect from the political correct fearful left wing appeasing pacifists!? Finally the pressure for the Danish government has become too much and the Danish foreign minister has sent a letter to the Arabic League expressing his respect for Islam and that Denmark does not wish any conflicts. Not an apology - but I wish he had not. One should of course not ridicule any religion just to hurt peoples feelings. But in this case and many other cases - it has little to do with religion and much more with politics and freedom. Islam is not only a religion but also a political system in our world. Any time that religion enters into politics - it must be treated the same as politics. That means open to criticisms and even ridicule. I suggest we publish the 12 drawings all over the Internet and eventually on every other lamp post in the world. Thus we might send a signal that can not be ignored. I like play online game, I also buy wonderland Gold and wonderland Gold, the wonderland online Gold is very cheap, and use the wonderland money can buy many things, I like cheap wonderland online Gold, thanks, it is very good.